Lowering the temperature in your home is always a priority once the hot, humid days of summer show up on your doorstep. This can easily be done with this progressive 12,000 BTU air conditioner as it's been made to cool down rooms up to approximately 500 square feet in size. This portable model features a single-hose design and its continuous-use, direct-drain system can handle a capacity of 50 pints every 24 hours. It runs quietly and smoothly on environmentally-friendly R410A refrigerant which is designed to keep the air fresh and cool. The variable electronic temperature control with LED display is easy to program and the remote control unit enables you to manipulate the appliance from anywhere in the room. Your personal schedule can easily be adhered to by using the automatic on/off feature to start and stop the unit whenever you choose. Relocating the air conditioner to any room is made easy with the built-in handles and castors. This top-of-the line air conditioning unit also comes with a 12-month warranty on parts and labour. 12 months parts and labour coverage with in-home service. This 24,000 BTU ductless split system is Energy Star compliant and has a 1-to-1 configuration. The inverter compressor operates more efficiently in extreme weather conditions. The external unit heating belt allows for cold weather operation to temperatures as low as -40C. Louver position memory restores function to your last saved setting and refrigerant leakage protection will shut down the unit in the event of a failure. These are permanent units and require a licensed HVAC installer. 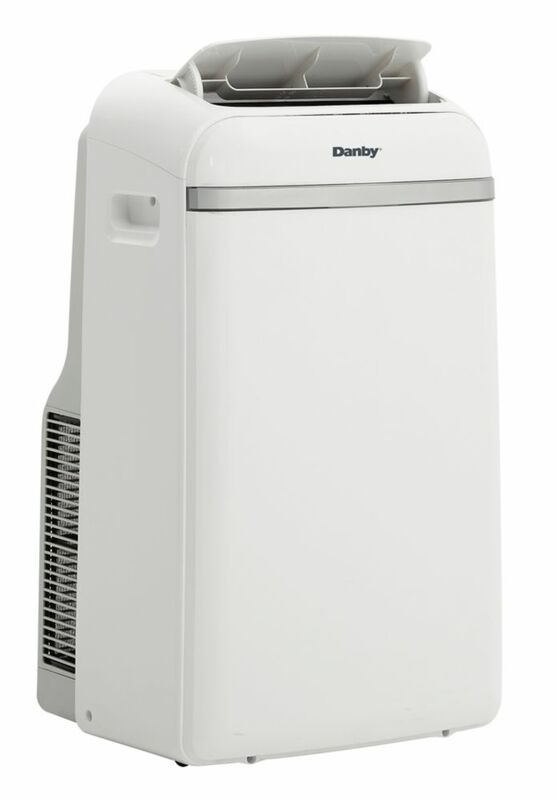 This 8,000 BTU window air conditioner by Danby is perfect for bedrooms and small living spaces up to 350 square feet. In addition to being cool and comfortable, the Ionizer function helps filter allergens and remove unwanted bacteria and odors from the living space. This air conditioner is Energy Star rated and with a 24-hour programmable timer, sleep mode and energy saver switch, this unit reduces overall operating costs and saves on your monthly hydro bills. To help maximize cooling, this unit comes with 4-way air direction and a 'follow me' feature where the remote control has a built-in thermostat that allows for more precise cooling. The LG Electronics 10,200 BTU Portable Air Conditioner with Remote features a dehumidifier that removes up to 2.45 pt. of moisture from the air per hour. Equipped with casters that allow for easy movement to the spaces that need chilling, this portable AC unit also includes a remote control for easy temperature, fan speed and timer adjustments from across the room. instructions) and cannot be used with extension cords. The LG Electronics 14,000 BTU WIFI Portable Air Conditioner with Remote features a dehumidifier that removes moisture from the air. It is equipped with casters that allow for easy movement to the spaces that need chilling, this portable AC unit also includes a remote control for easy temperature, fan speed and timer adjustments from across the room. This machine boasts 2-way up/down air deflection that circulates air evenly to eliminate hot spots, providing ample airflow to cool spaces up to 500 sq. ft. Furthermore, built in WIFI allows the user to control the unit from any location through LG Smart ThinQ APP. Note: the freestanding unit must stay upright for 24 hours before use, must be vented to the outside (window installation kit included with detailed instructions) and cannot be used with extension cords. 12,000 BTU Portable Air Conditioner Lowering the temperature in your home is always a priority once the hot, humid days of summer show up on your doorstep. This can easily be done with this progressive 12,000 BTU air conditioner as it's been made to cool down rooms up to approximately 500 square feet in size. This portable model features a single-hose design and its continuous-use, direct-drain system can handle a capacity of 50 pints every 24 hours. It runs quietly and smoothly on environmentally-friendly R410A refrigerant which is designed to keep the air fresh and cool. The variable electronic temperature control with LED display is easy to program and the remote control unit enables you to manipulate the appliance from anywhere in the room. Your personal schedule can easily be adhered to by using the automatic on/off feature to start and stop the unit whenever you choose. Relocating the air conditioner to any room is made easy with the built-in handles and castors. This top-of-the line air conditioning unit also comes with a 12-month warranty on parts and labour. 12,000 BTU Portable Air Conditioner is rated 4.2 out of 5 by 51. Rated 5 out of 5 by Rend from Great unit! This air conditioning unit works great! It’s quiet and easy to use and it cools off my apartment in no time. Awesome unit. Rated 5 out of 5 by Cool from For ALL the great features see mfg website This apt is full of walls. This unit is the perfect a/c for us. With two fans we can circulate cool air to make the entire place comfortable. This unit has eliminated the need for two additional window a/c's. Rated 4 out of 5 by walleye from Works well, efficient ... I purchased this for the bedroom, but have since moved it to the living room as it is the larger of two units we have. Works well, cycles on an off . . . often use it just with just the fan. Note: some efficiency is lost due to very warm hose being in the room. Considering raising it up to shorten the hose. Rated 5 out of 5 by Atari from I love it so much! Turns out 15/15 room from 90 degrees to 62 in about 10 minutes. I can sleep at night <3 super quite as well. Rated 5 out of 5 by Ccapple from Excellent Air Conditioner Easy to unbox, and install. Works very well and cools the first floor of my condo as expected. Rated 2 out of 5 by LM North from Mixed Feelings The jury is out as to whether or not this is a good unit. We picked this one due to the Home Depot specs comparing it to other models/brands and this one is supposedly whisper quiet. We find it disturbingly loud but, then again, we don't have another one to compare it with. Rated 5 out of 5 by Scott o from Awesome on the hot days! I purchased this unit last summer, and it has been a godsend since I bought it. It keeps the entire downstairs of my house nice and cool even during the 30 degree heat waves. Rated 5 out of 5 by Leam from Exactly what I wanted! It is perfect! I wish I would have bought it years ago! We have an old house with poor insulation. We got a mini split on the main floor but need something for the bedrooms. How quiet is this when sleeping, and would running 3 at once kill our power bill? What kind of window is it for? Sliding or the ones that you push outward? Could it cool my whole apartment if I keep it in my bedroom and leave my bedroom door open? It really depends on the size of your apartment. It might be sufficient if you have a one bedroom unit. I have a two bedroom unit and the one I have cools down the kitchen, living and dining room down fairly well, but i require an additional unit for my bedroom and spare room. What is the power consumption of it? And what kinds of windows can it fit? With the portable air conditioners,can you put the hose into a bucket instead of through the window? Hello Joanne, the exhaust hose needs to go through the window, however, the drain hose needs to be installed only when you set the dehumidifier mode. My Mother lives in a condo. She is interested in a portable unit. Her window opening is 19 inches vertically. Would this air conditioner work for this size of window to ventilate the hose out of it? Hello, the sliding kit that comes with the unit is made of plastic that can be cut so you can adjust it to the desired window. My windows are operated with a crank and have full screens that don't allow this kind of hose vent kit. Can I operate this thru' a wall if I install an appropriate air vent (such as a dryer vent ? Hello PompeyFan, as long as you do not extend the hose provided, you can install the unit through the wall. Hello, you can instal this model in a regular patio door (up to 81&quot; height) and it comes with the accessories to do so.